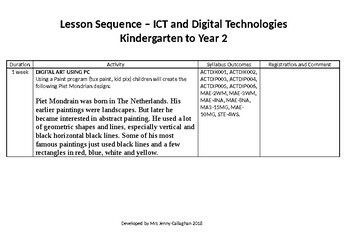 GET YOUR CLASS USING DIGITAL TECHNOLOGY. 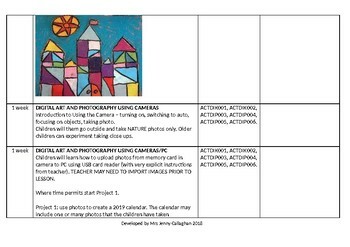 Lesson sequence to incorporate digital art and photography into the curriculum. 10 week program at approximately one hour per week. Includes Australian Curriculum and NSW Syllabus outcomes. Registration and comment section included. Cameras and/or I Pads can be used for the photography component. I Pads can be used for I Movie or Book Creator. 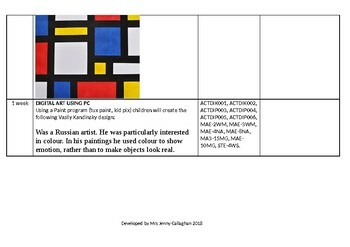 Can be used in the classroom for children of all ages. 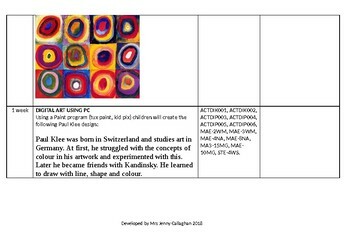 Time to complete activity is dependent on children's prior knowledge of coding and age. The Book Creator/I Movie activity has been successfully trialled in Year 1 to Year 6 (NSW Australia) using I Pads. Year 1 took approximately one hour to complete the activity, including time for viewing the I Movie/Book.